It is early spring. 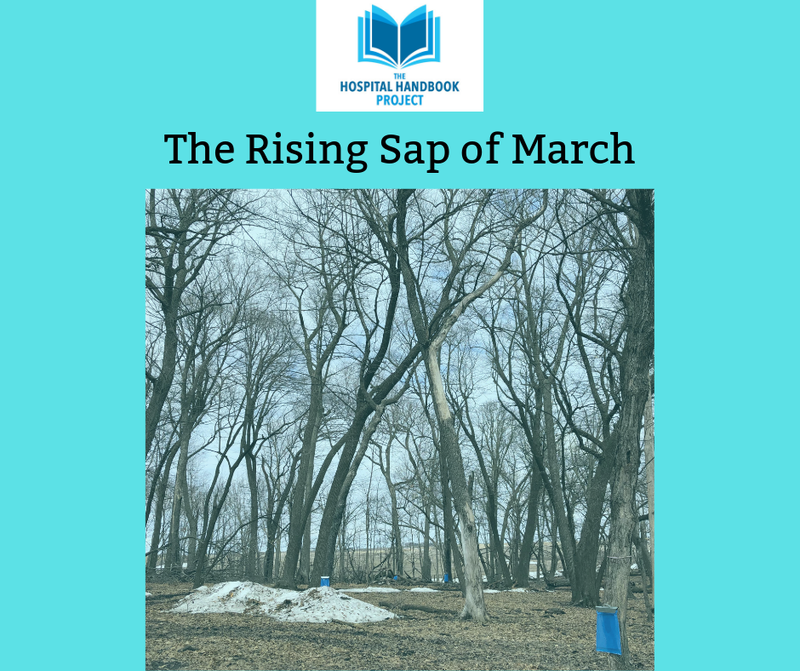 The sap is rising; the season for growth and movement. 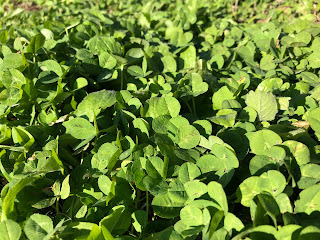 What are you noticing about the spring energy of growth and movement? Uncomfortable? Blocked? Perfect weather? More than ready to jump into summer after a long winter? Did you respond to the feedback form? Have you downloaded our free document, Getting Your Foot in the Door of Hospital Practice: First Steps…, yet? Please take the quiz to help me improve future products. All products help support the Project with the goal of making this community work sustainable. Next product available soon: the workbook for the Getting Your Foot in the Door pdf. The workbook has been going through edits and beta readers this past month. Looking for sponsor(s) to help cover the cost of video edits for the latest in the “Paths to Practice” interview series. In the “Paths to Practice” interview series, I interview a colleague about their path into hospital-based practice. There are options for full sponsorship and partial sponsorship. Please contact me if you or your business or organization is interested. Thank you for supporting this work. Did you know we have an online short course available? You can purchase access to this short course, “How to use a validated pain scale in your chart note” All proceeds go toward supporting the Project. On knee/joint replacement care, let's take a step back and look at models of care for the patient's care process from pre-surgery to recovery. The Bree Collaborative of Washington state finished the total knee replacement bundled payment model standard last year (2018). This is a one-to-watch for your medical centers. The Bree Collaborative is a standard-setter in value-based model care with patient-centered outcomes. It sets standards for WA state health care policy. These models they discuss work best in “centers of healthcare excellence (COHE or COE)” where patients can have access to all services in the bundle in one system and in a timely manner. From assessment of surgery to surgery to inpatient stay to post-operative care to rehabilitation care. Bree Collaborative, the landing page for the "total knee and hip replacement bundle and warranty" standard as well as other accountable payment model standards they have published. “Acupuncture for Chronic Pain in the Vermont Medicaid Population: Interview with Robert Davis, LAc” by Jennifer A.M. Stone, LAc. Meridians: JAOM, winter 2019, p. 35 -36, 45. Davis RT, Badger G, Valentine K, Cavert A, Coeytaux RR. Acupuncture for chronic pain in the Vermont Medicaid population: A prospective, pragmatic intervention trial. Glob Adv Health Med. 2018; 7:2164956118769557. Published 2018 Apr 10. On writing a scientific paper—this article is a good review with specifics to the practice of acupuncture and east Asian medicine. 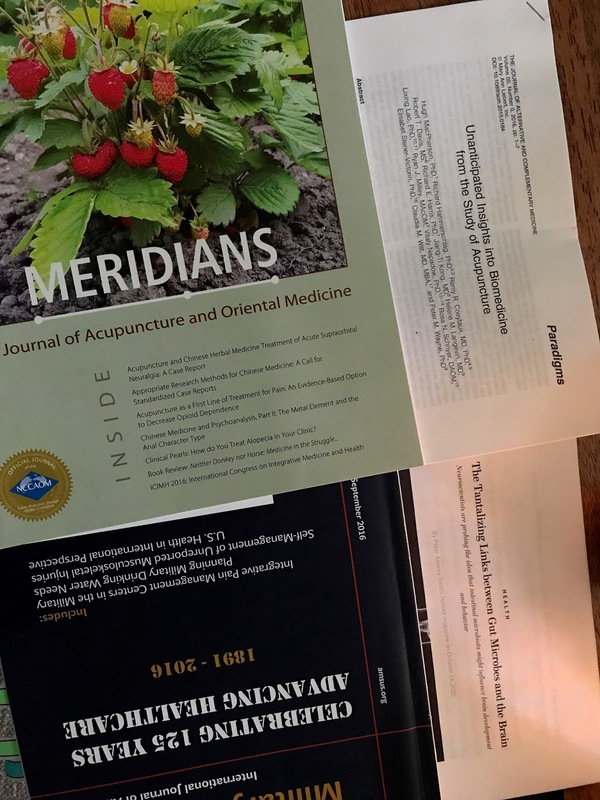 “Writing a Solid Scientific Paper That Will Sail Through the Peer Review Process: Valuable tricks from the experts” by Jennifer A.M. Stone, LAc, pages 30-35 of Meridians: The Journal of Acupuncture and Oriental Medicine, spring 2018. The U.S. Health and Human Services (HHS) call for information on pain management best practices, identify gaps in care, etc., to help curb the opioid crisis ends April 1st, 2019. Read the NCCAOM white paper submission to HHS here. The Massage Therapy Foundation (research) and the NCBTMB (massage therapy and bodywork) have collaborated to create a webinar series on the basics of research in 2019. The first webinar aired in February 2019, with the episode, "Why Research?" Go to their landing page to learn more about it. 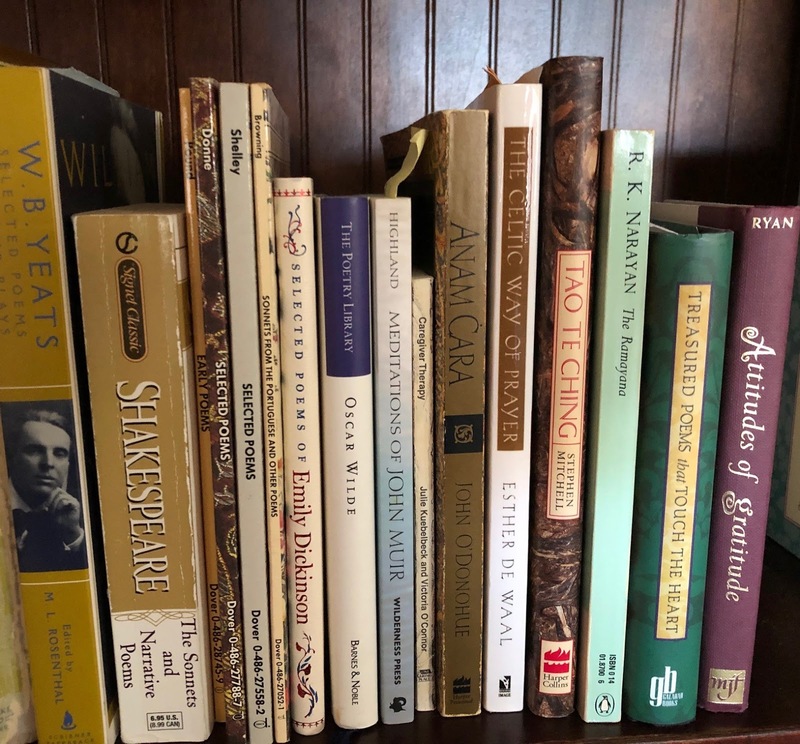 Recording of the February 2019 webinar, "Why Research?" or go to the NCBTMB channel. For the continuing education credit offered by Massage Therapy Foundation for watching this webinar, go to their website. 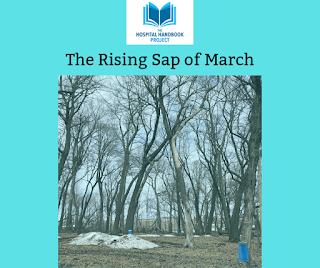 Here's the link to the full March newsletter if you missed it. Sign up on our email list to get future newsletters. The Pebble in the Pond: How Integrative Leadership Can Bring About Transformation by Adam Perlman, Bonnie Horrigan, Elizabeth Goldblatt, Victoria Maizes, and Ben Kliger. Informed Mindfulness: The Power of Awareness and Choice in Effective Leadership by Micahel Aquilino, Bonnie Horrigan, and Adam Perlman. "The Surprising Power of Simply Asking Coworkers How They're Doing" from the Harvard Business Review. Ideas for Getting Through the Afternoon Slump from Mindful.org. 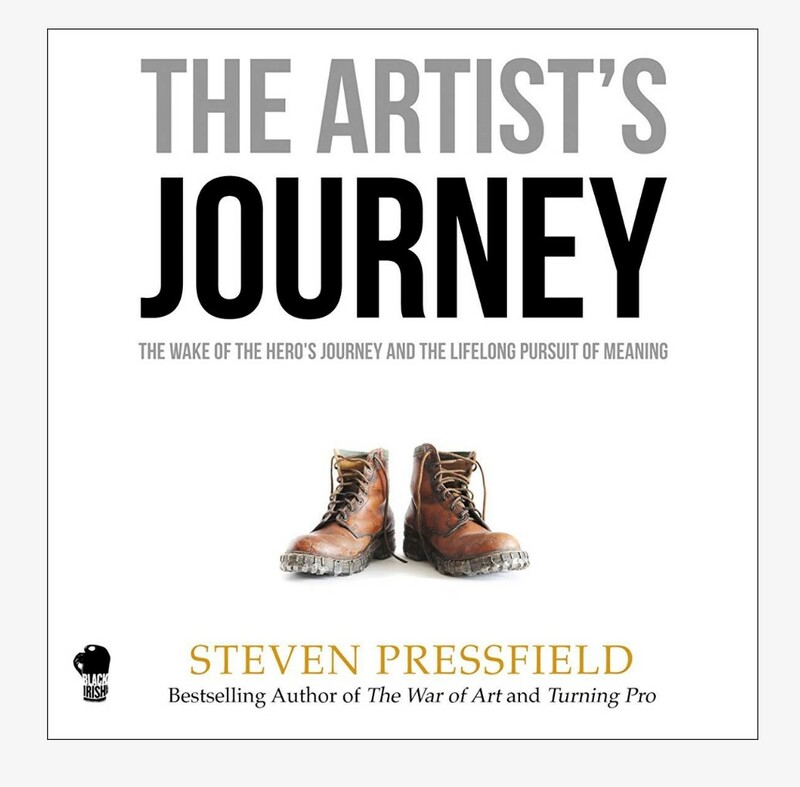 For more recommended reading (books and audiobooks) on leadership, see our Reflecting on Leadership post. At the Hospital-practice Handbook Project, we encourage practitioners to cultivate mentor-relationships and practice research literacy. The Massage Therapy Foundation is hosting a free webinar series on the basics of research on select days in 2019. The first one was in February 2019, "Why Research?". Go here for the recording. They also offere a continuing education credit for watching the episode, just go to their website. Research Perch podcast episode: "Massage Therapy in Outpatient Cancer Care part 1"
Research Perch podcast episode follow up, "Massage Therapy in Outpatient Cancer Care part 2". But, this episode dives into translational research...how research can inform clinical practice. Asking questions like: where did this come from? why do we do that? Just because something is common doesn't mean it is right. What is the therapeutic benefit for the patient? Is that model a business model or a model based on patient-centered care and therapeutic benefit? Treatment frequency, time in treatment, therapy used, tracking functional measures, etc. This is a good listen for any clinician in the field of integrative health. The January edition of the Jeffrey Silver Humanism in Healthcare Research Roundup includes 5 different analyses related to burnout and resiliency across various groups of healthcare professionals. More about building resilience through regular self-care at our HH Project post. More about the research behind clinician well-being and improved clinical outcomes for patients, you can peruse the National Academy of Medicine's 2018 "Clinician Well-being" series. The 2019 International Massage Therapy Research Conference will be May 9-10, 2019 in Alexandria, VA. "IMTRC 2019 will feature keynote speaker Helene Langevin, MD, Director of the National Center for Complementary and Integrative Health (NCCIH), and panel sessions on pain management and addressing the opioid epidemic with massage therapy. Education sessions will explore the use of therapeutic massage for arthritis, breast cancer, low back pain, and anxiety." The Society of Acupuncture Research (SAR) posted an easy-to-read blogpost on all the current NIH acupuncture research funding announcements. Massage Therapy Foundation Community Service Grants for 2019--apply before April 1st, 2019. Did you find this information useful or interesting? for "research and metrics Thursdays" on the public Facebook Page. If you could use an opportunity to renew your self-care, whether it is your new year resolution or just the spring-cleaning vibe, the Lenten season is as good a time as any. Lent is 40 days before Easter from Ash Wednesday to Good Friday. 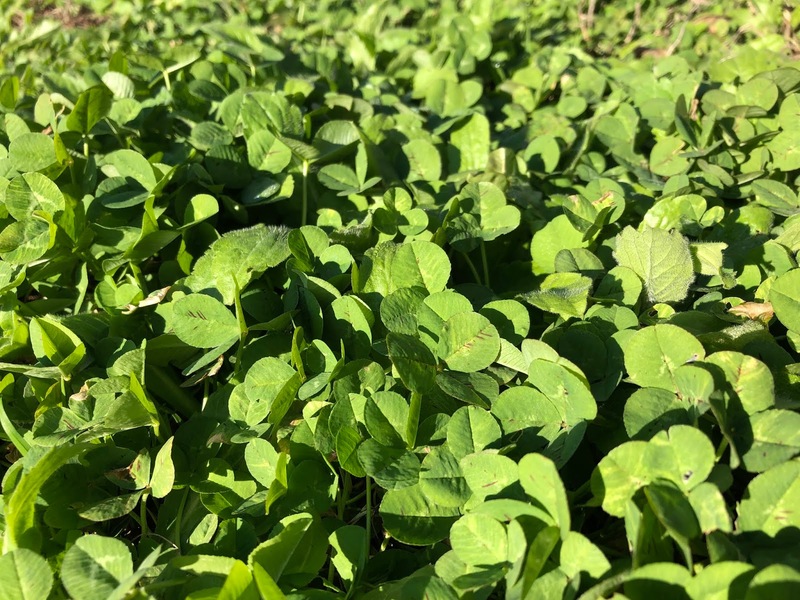 It coincides with the turning of the season from late winter to spring. The Christian observance of Lent focuses on self-reflection and discerning your path to your best self—to discerning your path/your calling. It is about clearing out the (internal) debris and clutter between you and God and turning your path back toward the Light. You don’t have to be Christian for these timeless ideas to sound familiar. So, in your self-care practice, pick what is true to you and your path. This blogpost is only my ideas from my limited experience. If some of this is helpful, great! If it’s not for you, that is okay; just let it go. So, in self-care practice, you should have some element of self-reflection. I discussed this briefly in an earlier blogpost about different categories of self-care to include movement, self-reflection/mindset/inspiration, nutrition/food, spending time outdoors, breathwork, and recreation/socializing and connecting to your community. As we move from winter to spring, take quiet time to be with your heart. Quiet, heart-listening time. What comes up for you? Peace or restlessness? If it is restlessness or discontent, can you identify where this is coming from? The energy of spring is about forward movement and new growth. Is there a change you need to make in your life? In self-reflection, slowly work to discern, what this discontent or restlessness is connected to. Is this leading you forward on your life path toward the best-version-of-yourself? Or is something in your current life or your lifestyle that has you stuck in a rut or leading you to something you do not want to be? What do you need to do to be closer to the best-version-of-yourself? Journal about it. Find mentors who can help you on your path. Keep working on it. 5 minutes/day minimum is better than no time at all. Identify (to yourself) the clutter you are clearing out to make space and peace in your heart and in your life. There are so many ways this can manifest, as many ways as there are individuals. 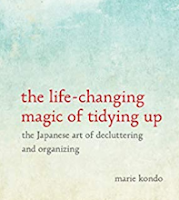 And, as an individual, you may find one pattern of clearing/de-cluttering/cleaning that works best for you. And you may notice you have familiar ruts you get stuck in. 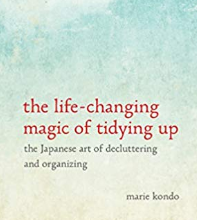 You may need to change up how you do your clearing/de-cluttering/cleaning when you “best way” is no longer working as well as it used to. Change is uncomfortable. And, change is constant. 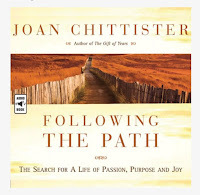 Sister Joan Chittister, in her book Following the Path: the search for a life of passion, purpose, and joy, says an individual rarely has just one calling in life. In fact, we are called to different things throughout our lives. But we must practice self-reflection and discernment to hear those calls and recognize what they are. And, have the courage to follow them. Saint Mother Teresa of Calcutta had a calling-within-a-calling. careers”. That we are following what we feel is “best fit” and “right at the time” careers that help us develop the skills we need for our “true calling”. But that everything eventually becomes a shadow of what your next calling is. We should be always listening to our hearts, discerning in our self-reflection practices, and taking stock of where we are in our path toward what we are called to be, the best-version-of-ourselves, and what that looks like, in that time and space. 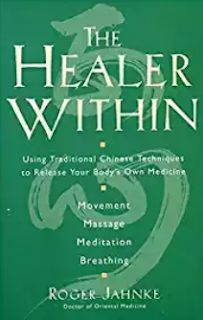 If you are looking for ideas to renew or start your self-reflection practice, here are some resources to learn more about mindfulness, clearing physical clutter, journaling, tai chi and qi gong, prayerwork, and poetry. Breathe Like a Bear: 30 Mindful Moments for Kids to Feel Calm and Focused Anytime (book) by Kira Willey, based on her music. Gaia.com has instructional videos on yoga for health and mindfulness exercises and a small number of tai chi and qi gong instructional videos. Mindful.org has many articles about mindfulness practices for health, for improved leadership skills, and mindful education (classroom) resources. Journaling, proven by James Pennebaker and colleagues (published in peer-reviewed scientific journals) to be useful in processing emotions and ideas in a healthy way. Journaling helps process experiences to find clarity. Journaling has proven health benefits. 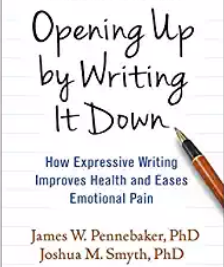 Opening Up by Writing It Down, 3rd edition: How Expressive Writing Improves Health and Eases Emotional Pain (July 2016) by James W. Pennebaker and Joshua M. Smyth. 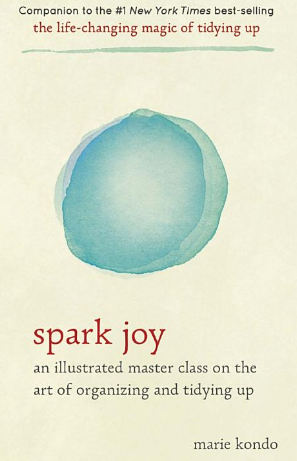 Expressive Writing: Words that Heal (2014) by James Pennebaker and John Evans. Work with your local certified instructor or NCCAOM board-certified acupuncturist. Work with a spiritual director in your faith. The oldest Christian monastic order, the Benedictines, have a tradition of outreach to community in spiritual direction from one-on-one sessions, group sessions, and retreats that are non-denominational or Catholic. 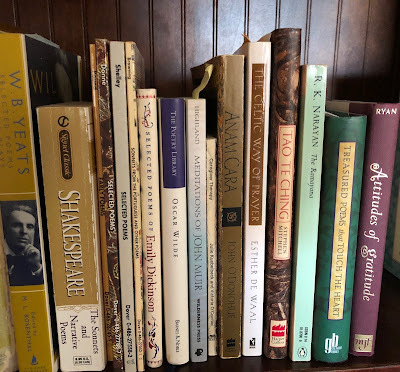 For example, see the St. Placid Priority programs in Olympia, WA, at the Priory Spirituality Center 2019 programs include art (felting, enneagram), music-facilitated imagery for the soul, and seasonal programs (Lenten retreat). 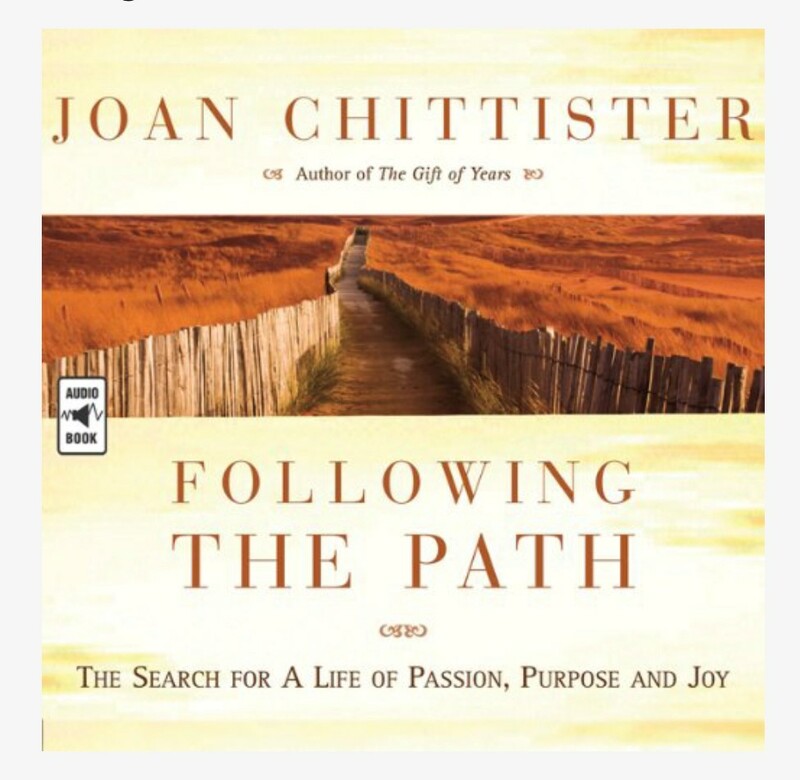 Or maybe other monastic traditions in your area may offer some form of spiritual direction. If you enjoy mindfulness practices and quiet contemplation, you may be interested in learning centering prayer. The old tradition of lectio divina that leads to the practice of centering prayer is both peaceful and healing but requires a mentor due to its complexity and depths. If this post on self-care was helpful to you, please support this work via our website and share with a friend. Peace to you in your self-reflection practice. "PCORI Ambassadors represent the entire healthcare stakeholder community and the program is open to anyone interested in advancing patient-centered outcomes research (PCOR). Get connected to PCORI Ambassadors and learn more about them." 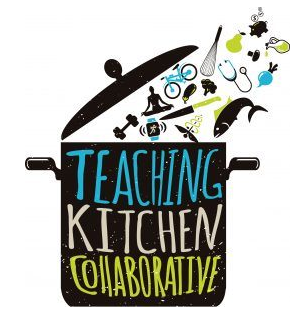 Do you know where your nearest Teaching Kitchen or Community Health Kitchen is located? Learn more about this resource and the research being presented at past Teaching Kitchen conferences, the Healthy Kitchens Healthy Lives annual conference. The 2018 National Academy of Medicine (NAM) "Non-Pharm Pain" Conference recordings are available. These are a recommended lunchtime listen and there is more information on the Lunchtime Listen page. Or you can go directly to the YouTube playlist. The U.S. Center for Medicare and Medicaid Services (CMS) call for research papers on acupuncture for low back pain and on the training and education of acupuncturists ended February 14th, 2019. See the related blogpost for more information on it. Several national and international organizations submitted white papers to CMS and will be publishing their white papers on their websites by spring, including the American Society of Acupuncturists and the Acupuncture Now Foundation. I will add those links, when they are available, to the CMS blogpost. The CMS call reference the AHRQ paper published in summer 2018. The link to this paper is also in the CMS blogpost. The Massage Therapy Foundation is hosting a free webinar series on the basics of research on select days in 2019. 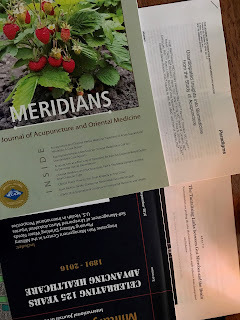 The winter issue of Meridians: Journal of Acupuncture and Oriental Medicine is out. If you have membership with your state professional acupuncture organization, you have free access to the full electronic edition. Or you can buy access to a specific issue or a subscription through their website. Send me a message through The Hospital Handbook Project website contact page or write in the comments below your favorite article of this issue or another issue! NCCIH and the National Cancer Institute hosted a workshop on "translating the fundamental science of acupuncture into clinical practice" earlier this month (February 2019). For those of your doing research on mechanisms of action, you may be interested in this NCCIH blogpost. The Quadruple Aim Study: a compass for the Triple Aim. Bodenheimer, T. & Sinsky C. (2014). From triple to quadruple aim: care of the patient requires care of the provider. Annals of family medicine, 12(6), 573-6. 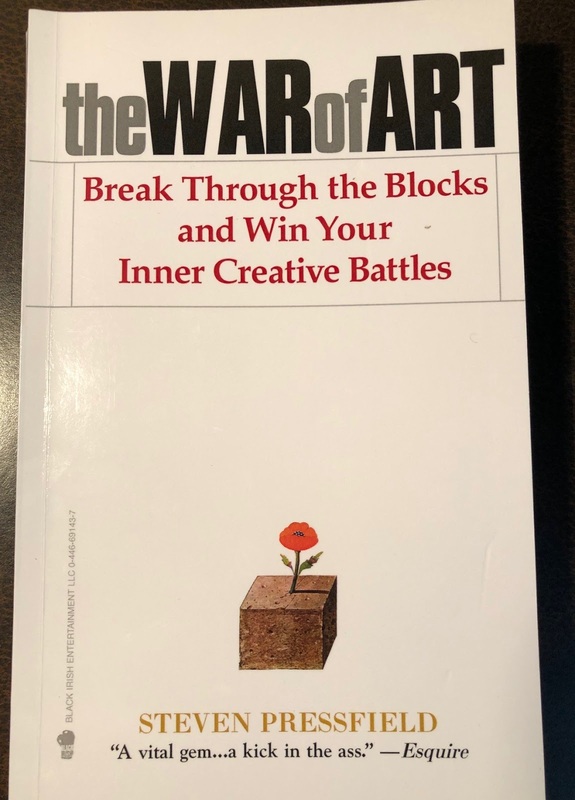 "To scale daring leadership and build courage in teams and organizations we have to cultivate a culture in which brave work, tough conversations, and whole hearts are the expectation. And, probably more importantly, armor is not necessary or rewarded." 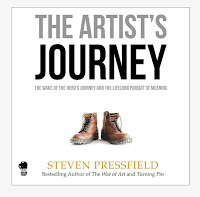 "If we want people to fully show up, to bring their whole selves, including their unarmored whole hearts, so that we can innovate, solve problems, and serve people, we have to be vigilant about creating a culture in which people feel safe, seen, heard and respected." "Daring leaders must care for and be connected to the people they lead. Care and connection are irreducible requirements for whole-hearted, productive relationships between leaders and team members." -Brene Brown, Dare to Lead: Brave Work. Tough Conversations. Whole Hearts. quoted from the audiobook. chapter 9. How to build a dream team in 5 steps--an interesting read on building a dream team with links to a free access lecture on the topic from LinkedIn learning. See the open (free) video "making your case", within the larger course, Having an Honest Career Conversation With Your Boss.